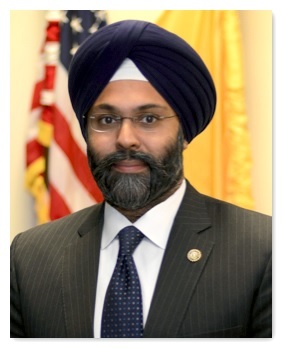 Gurbir Grewal became the nation’s first Sikh state attorney general when the New Jersey state Senate confirmed his appointment Tuesday. The 44-year-old was sworn in the same day. Newly elected Gov. Phil Murphy nominated Grewal, who was the Bergen County prosecutor, as the Garden State’s next attorney general, in December. He is also the second Indian American state attorney general, after Kamala Harris, now the junior senator from California, who served as the Golden State’s attorney general from 2011 to 2016. Grewal was nominated as Bergen County prosecutor by Gov. Chris Christie in 2016. Before that, he worked as the chief of the Economic Crimes Unit at the US Attorney’s Office. He also served as an Assistant US Attorney in both New York (2004-2007) and New Jersey (2010-2016). Grewal was in Jersey City and grew up in Hudson and Bergen counties. Grewal was praised for the initiatives he has taken during his tenure as the Bergen County. Combating the opioid crisis in Bergen County and promoting better relations between police and the people were among his accomplishments. A Glen Rock resident, Grewal has served as the president of the South Asian Bar Association of New York and a member of the New Jersey Asian Pacific American Lawyers Association. Gov. Murphy, while announcing the nomination, said he wanted an attorney general who could fight against the policies of the Trump administration. Grewal, who is married and a father of three, comes from one of the fastest growing segments of New Jersey’s population. The number of people of Indian descent in the state increased 73 percent during the 2000s. In Bergen, that number grew by 40 percent to 24,973 by 2010 or 2.8 percent of Bergen County’s overall population.